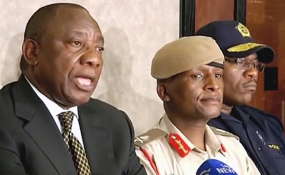 General Kamoli, centre, who is now being interrogated in connection with crimes committed while he headed the Lesotho army, at a 2014 news conference with the South African facilitator of crisis talks, Deputy President Cyril Ramaphosa, and the country's then police chief. Maseru — FORMER Lesotho Defence Force (LDF) commander, Lieutenant-General Tlali Kamoli, yesterday handed himself over to police for interrogation over crimes committed under his watch by the military, as the government ratchets up the prosecution of people implicated in various unresolved crimes. Police spokesperson, Inspector Mpiti Mopeli, last night confirmed to the Lesotho Times Lt-Gen Kamoli's detention and interrogation, adding that the former army boss would remain in custody overnight. "I am not sure how long he will remain in custody, but it will depend on the process of questioning," Inspector Mopeli said. "The interrogation is all about the events that took place during his leadership of the Lesotho Defence Force." Insp Mopeli would not be drawn to state the exact crimes Lt-Gen Kamoli was quizzed over, saying investigations were at a preliminary stage and the former LDF boss could either be released or charged based on the information gathered during the interrogation. Since its installation, following the 3 June 2017 National Assembly elections, the Prime Minister Thomas Thabane-led government has committed to prosecuting people implicated in various unsolved crimes especially in the military. The prosecutions are in line with Southern African Development Community (SADC) Commission of Inquiry recommendations for ensuring lasting peace in the instability-prone Kingdom. Already, a number of LDF members have been arrested and charged for crimes that were committed over the past few years. Appointed as LDF commander by then prime minister Pakalitha Mosisili in 2012, Lt-Gen Kamoli's tenure was characterised by turmoil and instability, with members of the military implicated in numerous unresolved crimes. In August 2014, Lt-Gen Kamoli resisted his dismissal by Prime Minister Thomas Thabane by attempting a coup. He deployed soldiers to raid and seize arms from three key Maseru police stations. Lt-Gen Kamoli accused the police of planning to give civilians firearms for use during a Lesotho Congress for Democracy street protest -- against the Dr Thabane-led government the LCD was part of. The demonstration had been for 1 September 2014 after relations within the coalition government had soured. The police dismissed the allegations out of hand. Dr Thabane fled the country on the eve of the attempted coup after receiving a tip off that his life was in danger. He would then only return the next month under heavy South African police guard. Police Sub-Inspector Mokheseng Ramahloko was shot dead during the 30 August 2014 attempted coup. Three LDF members were last week charged for his murder. The attempted putsch triggered a chain of events that led to the collapse of Dr Thabane's government and the intervention of SADC to prevent all out chaos. Lt-Gen Kamoli was eventually retired by Dr Mosisili in December 2016, after the latter had returned to power. Lesotho's development partners, such as the United States, had threatened to withdraw aid if he remained at the helm of the LDF. Sources privy to the matter told this publication Lt-Gen Kamoli was being interrogated over a raft of unsolved crimes, including the 27 January 2014 simultaneous bombings of the Moshoeshoe II homes of First Lady Maesiah Thabane, 'Mamoshoeshoe Moletsane and the Ha Abia residence of former police commissioner Khothatso Tšooana. As part of investigations into the attacks, the police had requested to interview eight LDF members, but Lt-Gen Kamoli refused to surrender the soldiers, thereby souring relations between the two security agencies. The sources said Lt-Gen Kamoli was also grilled over the 25 June 2015 killing of former army commander Lt-Gen Maaparankoe Mahao. Lt-Gen Mahao was shot dead by his erstwhile colleagues who claimed he resisted arrest for allegedly leading a mutiny against the army command. However, a SADC Commission of Inquiry established to probe the circumstances surrounding Lt-Gen Mahao's death deemed the mutiny allegations "highly suspect". The Mahao family also accused the LDF of killing him in cold blood basing on the account of his nephews who were with him during the incident. The sources also revealed that Lt-Gen Kamoli was interrogated over the 10 May 2014 killing of Lisebo Tang and maiming of her male companion, Tšepo Jane, by soldiers guarding his Ha-Leqele residence. Ms Tang was shot dead when the car she was sitting in with Mr Jane was peppered with bullets by LDF members guarding the home of Lt-Gen Kamoli. She died on the scene of shooting, with Mr Jane sustaining serious injuries and taken to the Makoanyane Military Hospital. A police report stated that the vehicle in which they were sitting was shot 123 times by the soldiers guarding Lt-Gen Kamoli's premises. It had been widely speculated that Lt-Gen Kamoli would only be arrested after SADC had deployed an agreed contingent force to avoid any fight back from his supporters in the army. The decision to call him for interrogation before the arrival of the force underscores the new coalition government's resolve to follow through on its prosecute soldiers accused of human rights abuses.